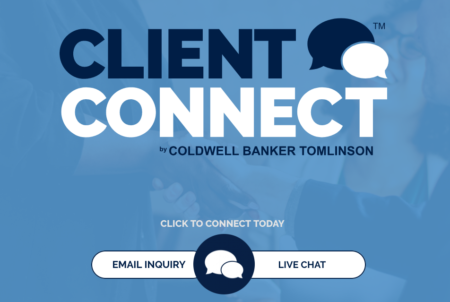 The Washington state-based Coldwell Banker Tomlinson franchise is launching Client Connect today, a proprietary customer service platform that can instantly pair clients with knowledgeable agents. The platform, which can be accessed on mobile and desktop, gives customers the option of sending an email inquiry or chatting with a live representative about any real estate topic. And within 5 minutes, Moore says that customer will receive a response — guaranteed. Moore said he was inspired by the first five points of The Parker Principles, a list of 12 actionable goals for members of the real estate industry that were conceived by several leaders in Palm Springs, California, earlier this year, during Inman’s Disconnect in the Desert conference. Before the launch of Client Connect, Moore said his 540 agents relied on a traditional lead generation and conversion model that included buying leads, culling leads from their website traffic, and then connecting with those leads via cold calls and mailers. But, his agents wanted a solution that would help them better “align and clarify what they were doing with their customers,” Moore said. So his team began developing Client Connect over the course of several months, testing each iteration with agents and making improvements based on their feedback. With the platform, Moore said his agents felt they finally had an avenue to be more visible, available, and valuable to their communities. “We focused on the principles we had control over, which were about quality, service, and transparency,” he said. “We are publicly embracing and sharing what that commitment means to us and our agents with our customers. Beyond the opportunity to improve his brokerage’s value proposition, Moore hopes the rollout of Client Connect will inspire other CEOs and broker-owners to take a look at The Parker Principles and create solutions, too.